Despite all the league championship titles they have won, speedway’s second most important piece of silverware, the Knockout Cup, has eluded Edinburgh Monarchs far more often than it should have. And last night at Sheffield, they exited this year’s competition when they slipped to 53-37 quarter-final second leg defeat, the Tigers going through 96-84 on aggregate. Monarchs had to get off to a flying start but they lost a 5-1 n the opening race when skipper Sam Masters and Mark Riss succumbed too easily to Josh Grajczonek and Todd Kurtz. Monarchs then pulled off a 4-2 in heat two, Max Clegg winning and partner Mitchell Davey claiming third place. But Monarchs were back in trouble again in the third race when Sheffield duo Lasse Bjerre and Josh Bates grabbed a second 5-1 over Mark Riss and Josh Pickering to lead 12-6 on the night. A 4-2 by Monarchs in the fifth heat was equalled by Sheffield in the next race and so the six-point gap was maintained and, with no tactical rides permitted in cup clashes, Monarchs were fighting hard to stay with the Tigers, who led by two points on aggregate. And the Tigers pressed even further ahead with their third 5-1 of the match in heat seven when former Monarchs Rob Branford and Kyle Howarth outpaced Erik Riss and Pickering. 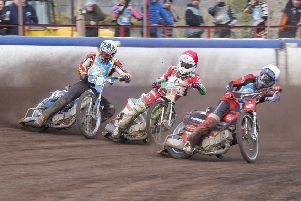 Sheffield sensed they were en route to the semi-finals when they slammed in yet another maximum advantage in the eighth race, Branford and and Kurtz triumphing over Mark Riss and Mitchell Davey to lead 31-17. Monarchs were beginning to feel submerged under a Sheffield points flood. Monarchs halted Sheffield’s dominance with a 3-3 in the ninth race Ricky Wells taking the chequered flag but you sensed the writing was already on the wall for the Capital side even though they managed to share the spoils again with a 3-3 in heat ten. This was followed by a 4-2 for Monarchs in heat 11 but it still left them eight points in arrears on aggregate and a 3-3 in heat 12 kept the defict the same but once again Monarchs’ heat leaders, who only won three races between them at this point, were found wanting. Masters and Wells picked up a 4-2 in a heat-13 sizzler which reduced the leeway to six points on aggregate. And a 4-2 from Sheffield in the penultimate heat clinched their passage to the last four and a showdown with Ipswich Witches. Sheffield: Grajczonek 14, Bjerre 11, Branford 10, Howarth 7, Kurtz 5, Bates 5, Parkinson-Blackburn 0. Monarchs: Masters 11, Wells 7, E Riss 5, Pickering 4, Clegg 4, Davey 4, M Riss 2.